Is transparency the only option? Perhaps. 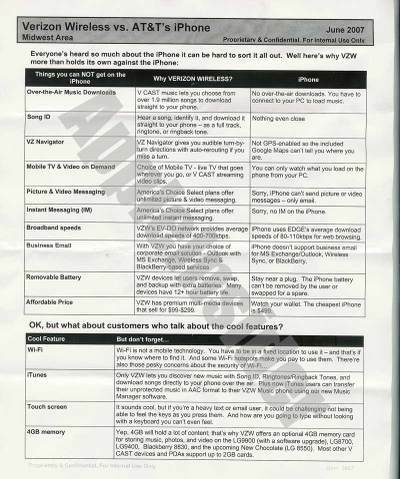 Verizon releases a “Proprietary & Confidential. For Internal Use Only.” memo to battle the mighty iPhone. And it’s on the web for all to see within hours. 1. If you’re a CEO, communications director, marketing VP, etc. of an organization that routinely broadcasts these sorts of memos, you’re only fooling yourself. The world just doesn’t work that way anymore. Imagine a public, pro-active piece of communication that points out the benefits of Verizon vs the iPhone for the whole world to see… that employees can actually point to with pride, etc. Imagine actually complimenting Apple for the making the iPhone while doing all of this – nobody is foolish enough to think that you’re the only guys making good stuff anyway. 2. No doubt managers, etc. sit around meeting room tables and question where all the loyalty has gone. They question how or why an employee might release this ‘sensitive’ information. They wonder about ‘employees these days’, etc. And, at the end of all this navel gazing, some may even decide that enhanced security measures are the key. Yeah, that might be one option. But creating an increasingly strict security environment for your staff isn’t exactly the best way to win the war for talent in my opinion. How about creating a more human organization? One that honours the individual contributions of everyone in it. One that delivers meaning not only to customers but to employees too. That might help you on a number of fronts.